With that opening statement, Philippine Ambassador to the U.S. Jose Manuel ‘Babe’ Romualdez introduced himself before the Filipino American community in the New York Tri-State, during a General Assembly on February 3. He said he attended Forest Hills High School in Queens after he got kicked out of Ateneo when he was a sophomore student. The statement elicited laughter from his audience. Such number is visible in the success of Filipinos across all sectors of American society. He commended the FilAms who have won political positions in New Jersey, such as Rolando Lavarro of Jersey City, Salvador Deauna and Arvin Amatorio of Bergenfield, and Jonathan Wong of Mahwah. 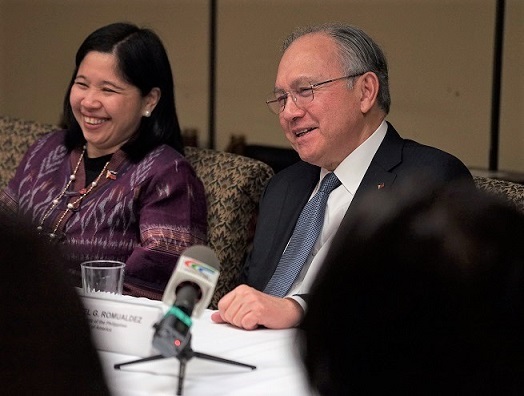 He also singled out to praise the FilAms in government service, such as Commissioner Carmelyn Malalis of the NYC Human Rights Commission; Housing Commissioner Maria Torres Springer; and Gil Quiniones, president and CEO of the New York Power Authority. Filipinos have a strong sense of professionalism and community involvement, he said. “(We) can make significant impact in this part of the world,” he said. He said the Philippine economic growth is the envy of its Asian neighbors. He disclosed how the Philippines is trying to put in place a subway system similar to what New York has. “In five years, matatapos na yung subway system sa Metro Manila. Maybe our subway is much better than New York’s,” he said by way of a joke. Romualdez was named ambassador by President Rodrigo Duterte in July. He presented his diplomatic credentials to President Trump four months later. Part of his jurisdiction includes the Commonwealth of Jamaica, the Republic of Haiti, Trinidad and Tobago, Antigua and Barbuda, Bahamas, Barbados, Dominica, Saint Kitts and Nevis, Saint Vincent and the Grenadines, and Saint Lucia. He was previously designated special envoy of the Philippine President to the United States. In a press conference early in the day, Romualdez said he feels “at home” with the press. He said he didn’t choose to be a journalist. “It just landed on my lap.” He couldn’t find a job and ended up working as a reporter for RPN 9. He eventually became the executive assistant to the Chairman of the Board of the station, and also president and CEO of People Asia magazine.